A friend of mine likes Stuck on you by Lionel Richie, I used to like it a lot too but I’m not so sure anymore. You see the song talks about the woman who’s there while our singer went about enjoying himself and being a fool. I dislike the sexist attitude that the woman should remain pure as driven snow while the man sows his oats and when he’s done his bit, he comes back to her now fully appreciative of what he has in her. Absolute balderdash! If you’re foolish enough to run rings around me, you should live with the consequences, I’m not having your oat sowing self in my life, if you’d sown plantains that would have been a different story. I’m a huge fan of Lionel Richie, as I write this ‘Penny lover’ plays on my note 10.1 and that song has been one of my favourite songs from age four (inherited my love for Lionel from my mum) even when I didn’t understand what he was saying Lionel has always been able to touch my heart. “Sail on” just came on 🙂 it’s an awesome breakup song, in the league of Cher’s Believe and of course “I will survive” by Gloria Gaynor. The lyrics above are from the song “Let it go” one of the songs from the motion picture “frozen”. I’d hated the song because it won the Oscar instead of “Happy”, however yesterday I was watching a parody video of the song, mummy version and I was struck by the instrumentals on the song, (or maybe it’s just because “you” liked it) looked for the song on youtube, watched the video and fell in love. I downloaded the song and have been listening to it a lot, now I see why it won the Oscar, beef na bad thing sha! I have a phenomenal memory for conversations most times, I can remember conversations that took place when I was four years old (but if you send me on an errand, I always manage to forget, daddy says the memory works only when it favours me) most times I can give you the place and time we had a certain discussion. The downside of this, is that I have a hard time forgetting the things that hurt me, moving on is not clear cut for me, memories could come at the drop of a hat and I can keep talking about the stupidest things that have happened (sorry Hero for boring you with silly stories that don’t concern you and thank you for not rolling your eyes when I start my T stories *I know I would* guess that’s why the vatican is considering you for sainthood, gosh! I let the cat out of the bag). The song reminded me to slam the door and walk away, distance will make it seem small eventually. I’m not perfect, have messed up (mummy and daddy don’t read this) and made mistakes, have had setbacks, so what? I’m crazy, will say what’s on my mind, incapable of pretense though I wish I could pretend sometimes, love without reservations, and have the temper of a tigress in labour, yes I’m not your average good girl, I don’t even like them anyway. So I’ll let go, the memories, the limits my mind had placed, let me be all I can be, soar to the skies and if I crash, you’ll never see me cry. Although this is a personal epiphany, I’m sharing this because one day I’ll want to remember how I felt right now… And how blessed I am for the gift of my friend “baby” who I’ve not had to tell “you don’t understand” because he gets it everytime! You’re amazing and I’m glad I have you at such a time like this. PS my parents occasionally read my blog, I can imagine how alarmed they’d be if they read this, won’t do anything you’d cringe about but there’d be some changes in your daughter. I saw this post on wordpress reader (I love wordpress reader, the posts there replenish the IQ points I lose when I visit certain gossip blogs). It reminded me of an experience I had several years ago about idle words and consequences. I just entered 200 level and narrowly missed getting hostel accommodation, that year Uniben introduced a crazy system where students would have to queue (according to their faculties) in front of the students affairs building to get the hostel application scratch cards. Complete madness I tell you, getting the cards was harder than an elephant going through the eye of the needle. When I finally got the card- they closed the site. When they finally opened the site… I got to the cafe late and couldn’t secure a system (I hadn’t yet learnt to use my feminine wiles, big wink), by the time I got a system, the spaces were exhausted. With bed spaces going for exorbitant prices which this Mbaise gal wasn’t going to pay for; even on an angel dust trip, overcrowded rooms and dirty hostels were not even my thing in the first place. Had no option but to consider moving off campus, my friends (who were in the same boat) and I formed a house search network and farmed ourselves to different places to search. Lectures had started and 2nd year pharmacy isn’t beans by any stretch of the imagination, we had to search fast and get settled. Finally we found a place in the dingy outskirts of Ekosodin- the notorious den of robbers and cultist, but desperate girls don’t ‘curr’. It was just one room and three of us had to share it, at that point I was even ready to buy a hostel bed space sef. We paid for the place, arranged it and moved in. I was the last to move in, my situation was less desperate than the others, I was staying in my uncle’s house near Uwagboe (a suburb in Benin-City. I moved in on the third Saturday in January, and settled in that day. The next day, after church service, I decided to go and read in one of the LTs at the Faculty of Agriculture. On my way there, I ran into a friend who was also going in the same direction and we talked and talked. I explained that I was going to be sharing a room with two other ladies and he had a violent reaction to my news. He was totally against the idea, three women in one was a sure recipe for quarrels and fights, we’d never get along. A part of me got incensed. How dare he say such things about women, (never mind that I’d had the same thought, us sistas have to stick together and defend each other in public at least) so I kept telling him “we’ll live in peace and won’t quarrel, we’re adults afterall, besides we three are nice people” for the next 500metres we kept at it, finally I got to my destination, went in and read. End of story? Not quite! Two years later my roommate and I were talking about unreasonably foolish men (our second favourite topic) and she said “remember that your friend that was insisting that we’d quarrel and fight daily” I had no idea what she was talking about, she stated the location and time and I was flummoxed! You see, I had no idea she was even going out that day. She not only heard that conversation, she remembered it word for word! Now what if I had said something bad about her, or just said something unflattering about the new living arrangements? I would have soured the relationship before it had a chance to start. I had tears in my eyes at her next words, she said “and that’s when I knew we were going to be sisters, I knew then you’re an okay babe”. Till today I get shivers when I remember that incident because Chinwe is one of the biggest blessings of my life and I’d have soured it by a few loose words. Matt 12vs 36 says we’ll give account for every idle word spoken, this post is not about the power in words and speaking positively but being mindful of what you say anywhere you find yourself, you never know who’ll be walking past. Let me close with a story I saw online. The last line is a kicker, innit? “No you can’t” replies your friend…. My eyes dart to his face in shock. What just happened? What’s the true story? Strange wetness on my pillow, was I crying? 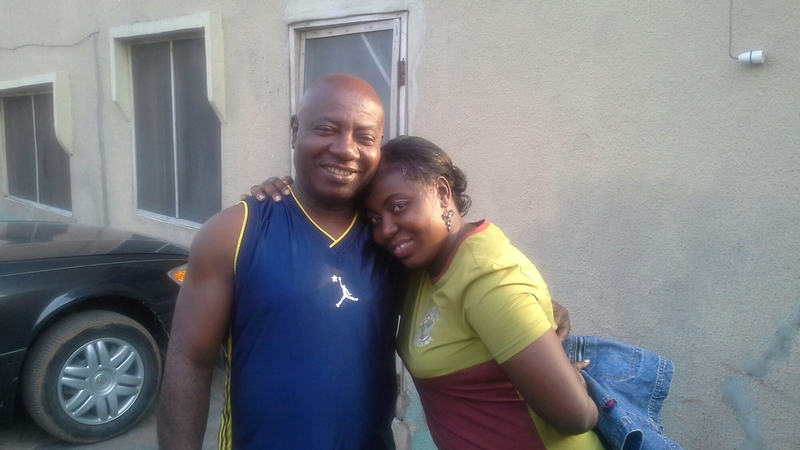 She’s the one “who’s there for you” while I toil to get my degree…. When I was growing up, I used to read a lot of novels and was always encountering new words, I’d always ask him for their meaning and his answer was invariably “bring the dictionary and look it up” that answer annoyed me to no end, this man went to school to study English language and he’d been teaching the same English language longer than I’d been alive, yet he wouldn’t tell me the meaning of anything. Now I’m glad he made me learn to search for answers myself and not wait to be spoon fed. Today’s Father’s Day and I ponder on the many ways my dad has shaped my life, he taught me how to think logically, how not to take decisions based on emotional persuasions and how to see all the angles, I may not have been the best student but I had the “bestest” teacher. As the eldest child he always tried to instill a sense of responsibility for my younger brothers in my actions, at the time it was annoying. Now I’m glad that my brothers and I are extremely close and they can come to me when they need a listening ear. he also insisted we share everything, right down to a bottle of coke. My father was and is a storyteller per excellence, he told the most interesting stories. When he talked about history you can all but stretch your hand and touch the era in question. His stories about being a soldier in the civil war were so vivid that it took his both parents and my mum to jointly tell us my dad was too young to have fought in the war, yet a part of me still believes he saw battle. His stories about his university days while causing my brothers and I to roll our eyes at his description of how frugal he was, but his stories also make me weep for Nigeria. Basically you can add anything you like and you can tweak the recipe to suit your taste. 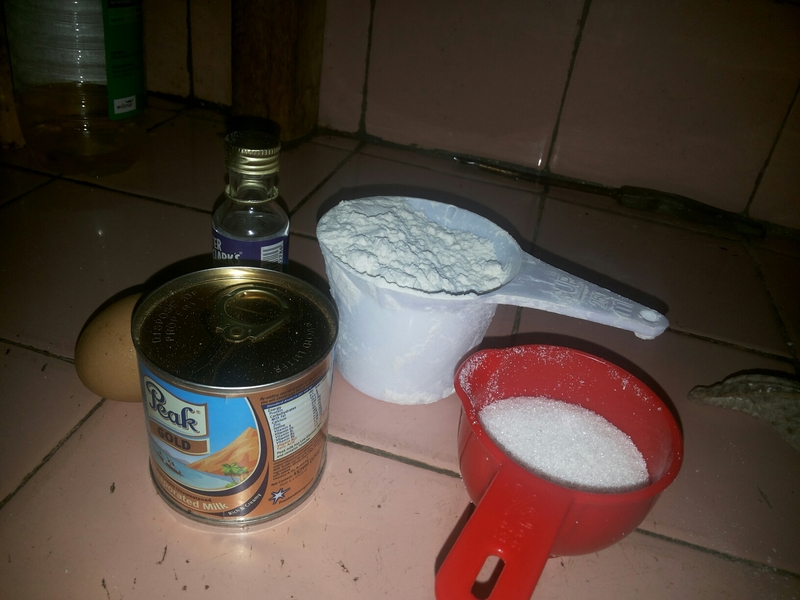 One cup of flour, one egg, a tin of peak milk, a quarter cup of sugar and half teaspoon of coconut flavour. I like to use either nutmeg or coconut flavour for my pancakes because of their nice scent and their ability to stimulate the taste buds. 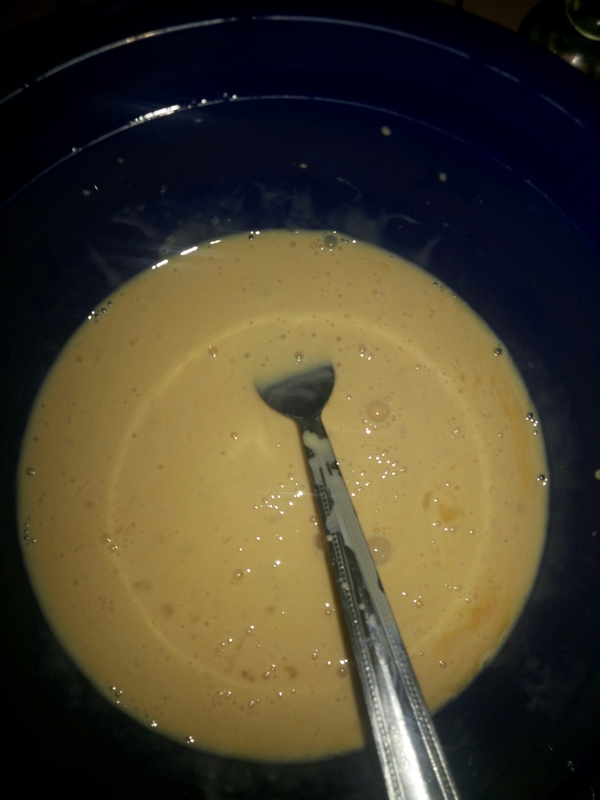 First I beat the egg and add the milk. I used the whole tin because I wanted the heft that milk gives it. 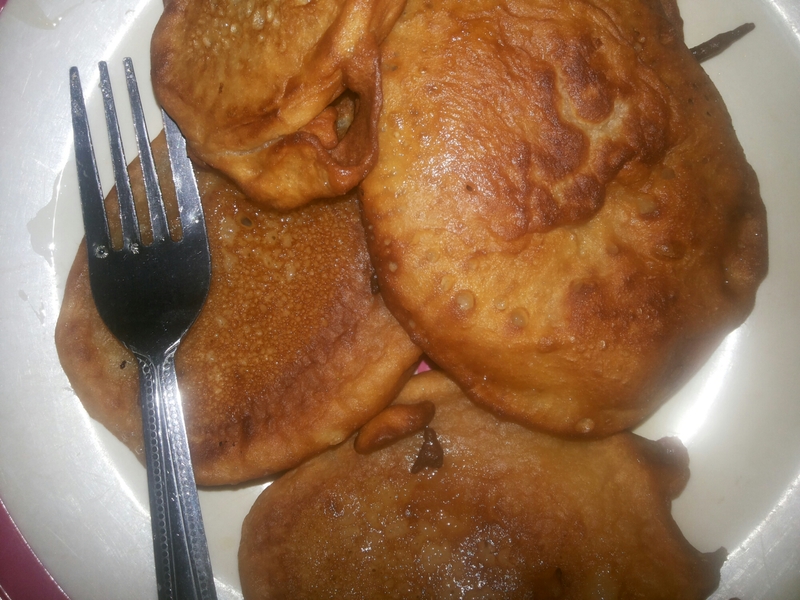 You can actually make pancakes without milk… My aunty makes them without milk and I’m not too fond of her version. Then I added the sugar and just enough water to dissolve it plus a pinch of salt and then stirred the mixture to dissolve the sugar. 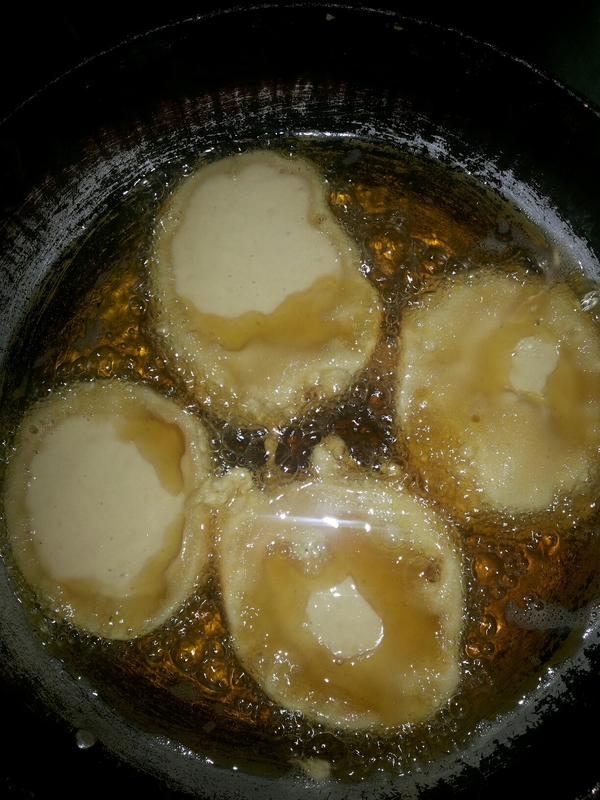 I heat oil till it was very hot and then added four big spoonful of batter into my frying pan. Waited for it to brown, turned it over and…. The whole process took less than 15 minutes. Pancakes are one of the pillars of my cooking repertoire and believe me there’s nobody I’ve ever made it for who hasn’t begged, yes begged! to have me make it again for them… You can bet it’s my go to meal when I want to impress. PPS: someone might wonder “whatever happened to your weight loss odyssey” and to you I say… I no go die because say I dey lose weight, once in a while I’ll eat what pleases me. and pay school fees for twenty one years for me to end up a trophy on your shelf. 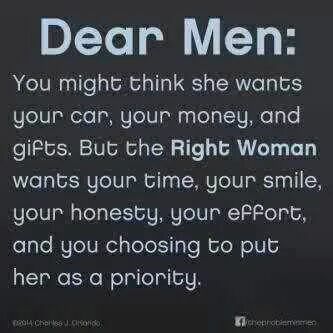 All I need is your time, your affection, your attention and respect. I need to be to know I’m important to you, to know I run through your mind more than once daily.